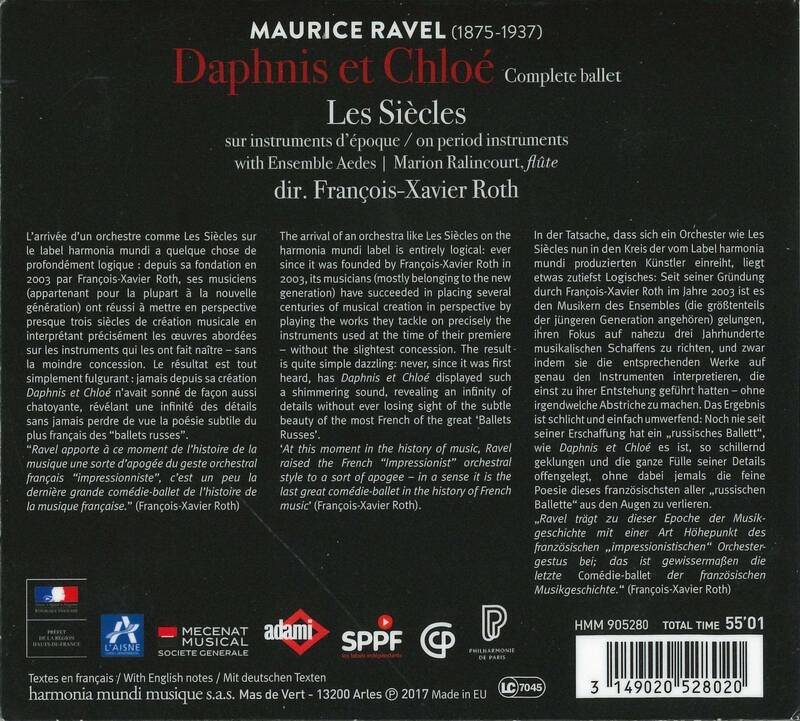 'The arrival of an orchestra like Les Siècles on the harmonia mundi label is entirely logical: ever since it was founded by François-Xavier Roth in 2003, its musicians (mostly belonging to the new generation) have succeeded in placing several centuries of musical creation in perspective by playing the works they tackle on precisely the instruments used at the time of their premiere – without the slightest concession. The result is quite simple dazzling: never, since it was first heard, has Daphnis et Chloé displayed such a shimmering sound, revealing an infinity of details without ever losing sight of the subtle beauty of the most French of the great ‘Ballets Russes’.‘At this moment in the history of music, Ravel raised the French “Impressionist” orchestral style to a sort of apogee – in a sense it is the last great comédie-ballet in the history of French music’ (François-Xavier Roth). 'Daphnis and Chloé' is conceived as a ballet in one act and three parts, and tells the story of the love between the shepherd Daphnis and the shepherdess Chloé. A warlike tableau is framed by two pastoral ones: in the first, Daphnis and Chloé acknowledge their mutual love following a dance contest that provokes the jealousy of each of them in turn. The interruption of a group of pirates, who abduct Chloé, puts an end to the rejoicing. The second tableau depicts the pirate camp; the captive girl is commanded to dance for her abductors. In the final tableau, Chloé is restored to Daphnis through a miracle of the god Pan, whom the nymphs have called on for help. After miming the tale of Pan and Syrinx, the young lovers let their joy burst forth in a General Dance of dazzling orgiastic virtuosity. The orchestral forces are the largest Ravel ever employed and he adds a mixed chorus that sometimes hums and sometimes sings. 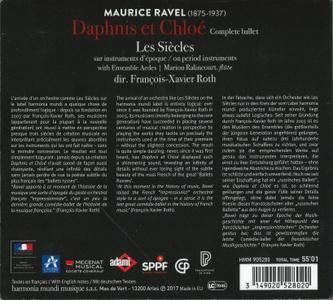 As we have come to expect, François-Xavier Roth, in his début for harmonia mundi, has gone through Ravel's much-amended score with a fine-tooth comb and subsequently showed himself capable, in a ‘historically informed’ performance, of reproducing with the musicians of Les Siècles all the transparency and stylistic precision one could wish for in Ravel’s masterpiece. 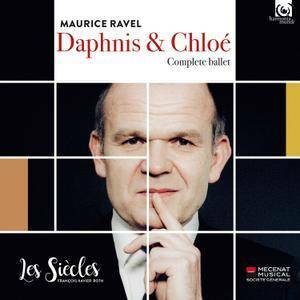 "Daphnis et Chloé is part of the large-scale project we embarked on with Les Siècles in 2009: the odyssey of the Ballets Russes. To celebrate the centenary of that incredible artistic adventure, we wanted to reconstruct the Parisian orchestra that premiered these works in order to restore their original colours…As with each work of the Ballets Russes that we’ve played so far, we noticed just how remarkably the instruments of Ravel’s time, those French-built instruments typical of the early twentieth century, do justice to this music and make it meaningful!" FXR ….